Straightening teeth can be beneficial for more than just the overall appearance of one's teeth. By straightening teeth, patients also gain health benefits from teeth that do not have as many places to trap food in them as crooked teeth. However, many patients do not prefer the obvious and cumbersome metal braces that they have to wear in order to straighten their teeth. Fortunately, we offer clear aligners as an alternative to braces that are just as effective. Patients will be able to benefit from wearing clear aligners while also straightening their teeth in a discreet manner. Clear aligners are an efficient alternative to traditional braces. Here are a few key factors that people need to understand about clear aligners. Clear aligners are the preferable choice for many patients since they are removable and are not obvious to other people. The clear aligners come in a set, with each aligner being at a different position that gradually pushes the teeth into the proper position. 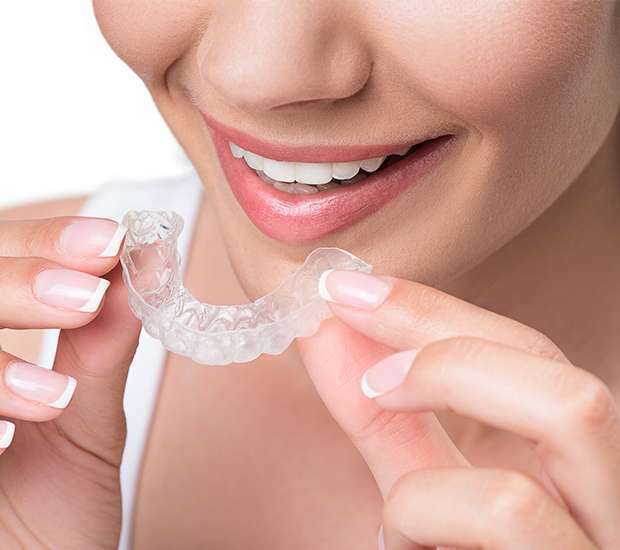 The aligners consist of a clear plastic material that does not change the color of the teeth and will only be noticeable when the wearer tells someone to look at the teeth up close. With the discreet appearance, patients will not need to feel self-conscious about wearing clear aligners. Before patients begin the process, we will need to take molds and measurements of the patient's teeth. We will then send this data to the lab and measure out the treatment plan. For the treatment plan, the patient will wear different clear aligners every two weeks or so and move onto the next pair. With this process, the patient will only feel pain for the first day or so and will have straight teeth before they know it. Clear aligners are also removable but need to stay in the patient's mouth for at least 22 hours a day. If the patient needs to remove the aligners to eat or to play a sports game, then he or she just needs to place them back in as soon as possible. When eating, patients will remove the aligners and return them to the mouth once they finish eating and clean their mouth out. People may also remove the aligners for an important meeting, presentation, date or to take photos. Below are a few factors that patients need to keep in mind when they are wearing clear aligners. Clear aligners are not always the best treatment for children or children in their early teens. Since clear aligners require more responsibility to care for, children are not always responsible enough to take proper care of them. In many cases, a child may remove the clear aligners for lunch and then throw them out with the lunch bag by accident. The child may also have trouble remembering to remove the aligners to brush his or her actual teeth each night and then replace the aligners. Since they require more care, we recommend that children stick to braces until they are more responsible. While clear aligners are great for being a discreet straightening option, patients need to clean their teeth after each meal before placing the aligners back in. Patients remove the clear aligners to eat or drink and then must replace the aligners. However, if one does not clean his or her teeth before replacing the aligners, then there is a good chance that the food will be visible in the aligners. Thus, we recommend that patients strive to brush or at least rinse the mouth with water after every meal. While clear aligners are removable and the patient needs to take them out for certain situations, the patient needs to put them back in fairly quickly. With braces, the patient does not have the option to remove them and does not interrupt the overall straightening process. However, removing the aligners for too long can cause the teeth to begin to return to their old position. The longer a patient removes the clear aligners for, the longer the treatment can take overall. Therefore, it is best to only remove the clear aligners for a certain amount of time before returning them to the mouth. If you are interested in clear aligners or need us to replace some lost aligners, give us a call to schedule an appointment. We will go over options and determine if clear aligners are the best treatment for straightening your teeth. Give us a call at (314) 266-4052 today. Q. Can I remove clear aligners when I want? Q. What are the aligners made of? Q. Can my child use clear aligners? Teeth Whitening And Sensitivity: Can You Avoid It? A whole health approach combined with sincere care in a spa-like atmosphere delivers an ideal dental experience. Copyright © 2019 All Rights Reserved Sinha Family Dentistry.